Properties in Gujan-Mestras average 4.6 out of 5 stars. Property 15: Nice housing fully equipped! BASIN of Arcachon located in a luxury villa in the golf GUJAN-MESTRAS. Property 16: BASIN of Arcachon located in a luxury villa in the golf GUJAN-MESTRAS. Studio house Bassin d'Arcachon "Escale Bassin"
Property 28: Studio house Bassin d'Arcachon "Escale Bassin"
Property 42: Bay of Arcachon "La Douiria" quiet studio. 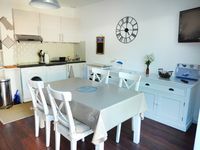 Property 48: Arcachon center, studio direct access beach, exceptional sea view.